Read an excerpt from chapter one: "Heirloom Food, Edible Memory". Each week during the growing season, farmers’ markets offer up such delicious treasures as brandywine tomatoes, cosmic purple carrots, pink pearl apples, and chioggia beets—varieties of fruits and vegetables that are prized by home chefs and carefully stewarded by farmers from year to year. These are the heirlooms and the antiques of the food world, endowed with their own rich histories. While cooking techniques and flavor fads have changed from generation to generation, a Ribston Pippin apple today can taste just as flavorful as it did in the eighteenth century. But how does an apple become an antique and a tomato an heirloom? 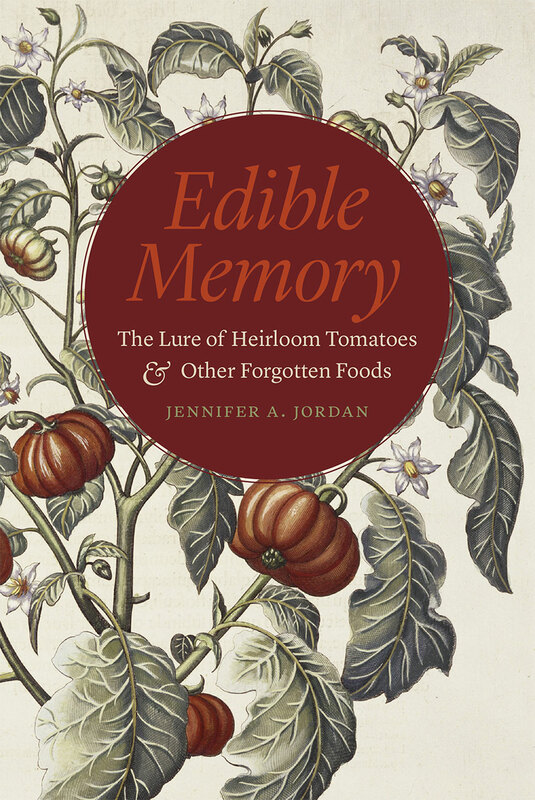 In Edible Memory, Jennifer A. Jordan examines the ways that people around the world have sought to identify and preserve old-fashioned varieties of produce. In doing so, Jordan shows that these fruits and vegetables offer a powerful emotional and physical connection to a shared genetic, cultural, and culinary past. Jordan begins with the heirloom tomato, inquiring into its botanical origins in South America and its culinary beginnings in Aztec cooking to show how the homely and homegrown tomato has since grown to be an object of wealth and taste, as well as a popular symbol of the farm-to-table and heritage foods movements. She shows how a shift in the 1940s away from open pollination resulted in a narrow range of hybrid tomato crops. But memory and the pursuit of flavor led to intense seed-saving efforts increasing in the 1970s, as local produce and seeds began to be recognized as living windows to the past. In the chapters that follow, Jordan combines lush description and thorough research as she investigates the long history of antique apples; changing tastes in turnips and related foods like kale and parsnips; the movement of vegetables and fruits around the globe in the wake of Columbus; and the poignant, perishable world of stone fruits and tropical fruit, in order to reveal the connections—the edible memories—these heirlooms offer for farmers, gardeners, chefs, diners, and home cooks. This deep culinary connection to the past influences not only the foods we grow and consume, but the ways we shape and imagine our farms, gardens, and local landscapes. From the farmers’ market to the seed bank to the neighborhood bistro, these foods offer essential keys not only to our past but also to the future of agriculture, the environment, and taste. By cultivating these edible memories, Jordan reveals, we can stay connected to a delicious heritage of historic flavors, and to the pleasures and possibilities for generations of feasts to come.